Webb made her national debut in 2016 and said “it means the world to me to be given a contract”. “I really want to play sport for a living while I’m still young enough,” she said. “So this is a huge opportunity for me to do that. “It was quite a surprise as I always felt there were up-and-coming players who had worked just as hard for a contract and their chances would be better. 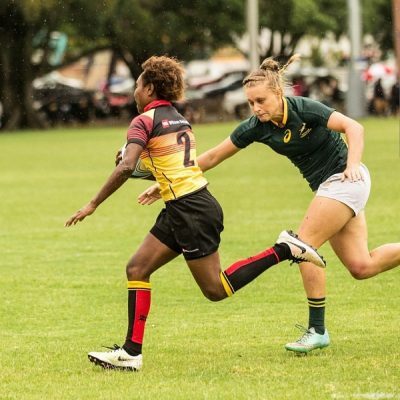 Her contract is for two years and Webb, who grew up in Gonubie, East London, said it was a relief to able to focus on “just playing rugby”. “If we can do that, we will still make it through to the other side,” said Webb. “We knew it was going to be tough for us, but we decided that no matter the challenges we faced we would stick together and make sure we played for each other. “And it turned out that we made the final, beating the [invitational] Tribe 7s team [22-12] and then overcoming one of three Japanese teams at the tournament in the semifinals [40-5].